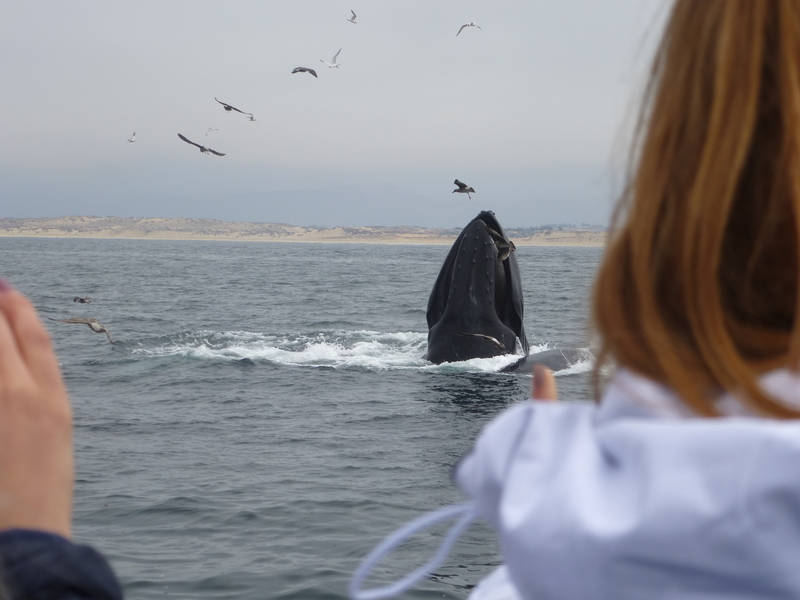 Here are just a few photos and videos of our whale-watching trip that left from Moss Landing, California, and took four hours. 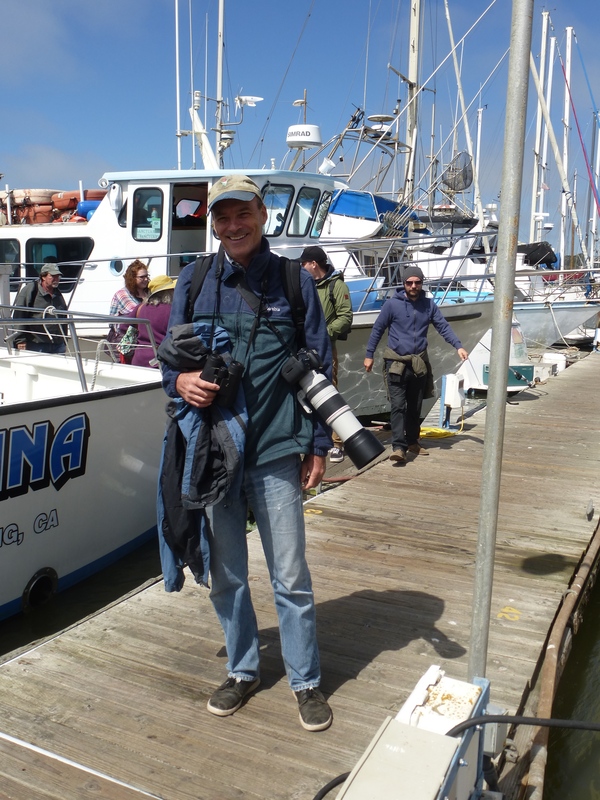 I was accompanied by UCSC ecologist/ornithologist Bruce Lyon, who also showed us on this trip peregrines and the elephant seals I wrote about previously. Bruce has contributed many photo series to this site. One of the larger rorqual species, adults range in length from 12–16 m (39–52 ft) and weigh around 25–30 metric tons (28–33 short tons). The humpback has a distinctive body shape, with long pectoral fins and a knobbly head. 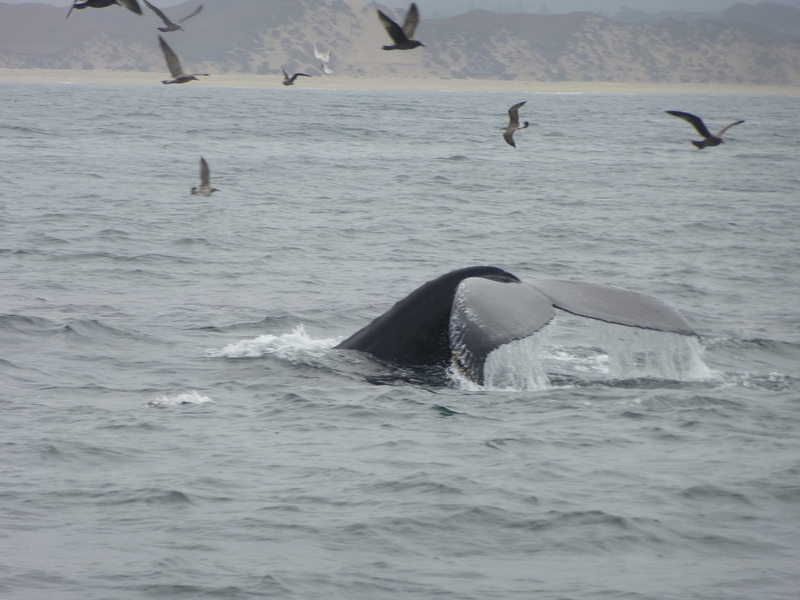 It is known for breaching and other distinctive surface behaviors, making it popular with whale watchers. Males produce a complex song lasting 10 to 20 minutes, which they repeat for hours at a time. Its purpose is not clear, though it may have a role in mating. Bruce has better photos than I, as he is a much better photographer and has much better equipment, so I’ll post those later. In the meantime, here are two videos and a few photos I took with my point and shoot camera. 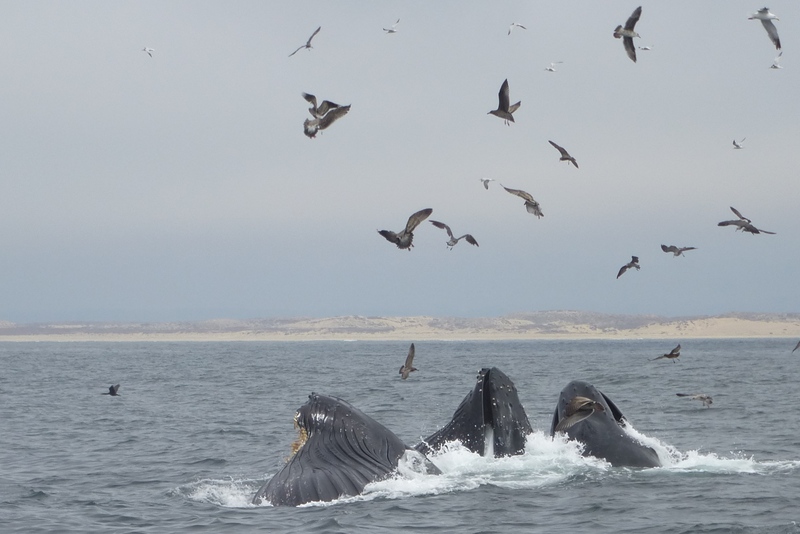 The humpbacks are herding and gulping down huge flocks of anchovies, helped by gazillions of seals (or sea lions; look for the ears to see the latter), with birds hanging around to eat the scraps. What one sees first is a literal carpet of seals and birds on the surface, which appear from nowhere. 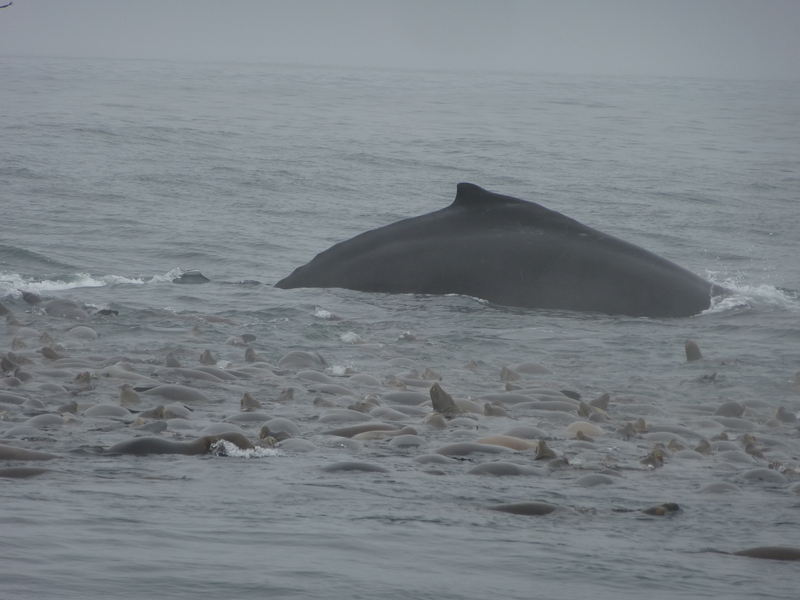 Then you know that a whale surfacing is imminent, as I think the seals help with the herding. Then the giants surface, audibly blowing through their blowholes and gulping huge mouthfuls of fish. The seals and birds enjoy the leavings. Three whales “lunge feeding”, driving fish to the surface and then, in a group (they often work together), rising to the surface with mouths open. 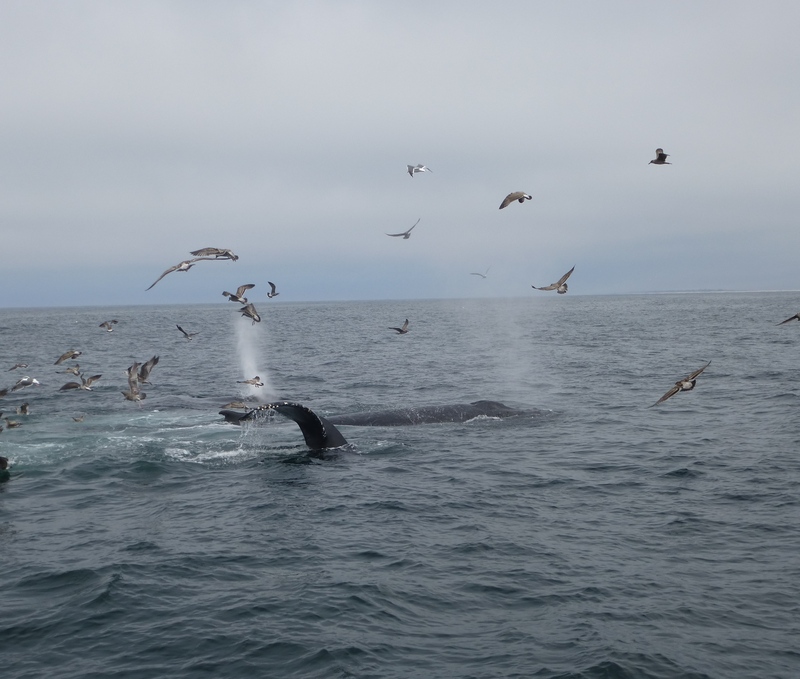 These were close to the boat, as you can see, and the naturalist estimated there were about eighteen humpbacks feeding around our boat. The seal carpet marking where the whales come up. Note its tiny dorsal fin. And Bruce Lyon with his gigantic lens, happy (as was I) that we had a successful trip. This entry was written by whyevolutionistrue and posted on September 10, 2018 at 11:00 am and filed under animal behavior, mammals. Bookmark the permalink. Follow any comments here with the RSS feed for this post. Both comments and trackbacks are currently closed. Wonderful whale pictures. I hope to someday see something so majestic. I live up in the Pacific North West, and some of you may have been hearing about our troubles with our resident orcas – J-Pod. One of the mamas made headlines after her calf died and she carried it for weeks and thousands of miles. Another is severely emaciated and we’ve been feeding it salmon with dewormer and antibiotics. Some have suggested that in addition to cutting fishing, we need to cut back on the whale watching as well. Basically making the point that the boats are harassing the already stretched thin whales. Is there any evidence backing that up? Those are all California sea lions. Wow! Whales galore. I’ve never been whale watching. I’d love to get up close to the feeding. Attenborough’s film ends with a devastating scene of a whale in action from below. Be sure to check that out. Many years ago, I went to Sea World in San Diego and paid an unauthorized visit to the whale pool after the last “show”, when no other visitors were there. One of the Orcas surfaced right in front of me, flashed the great, five-foot wide, toothy grin, and commenced to speak in a succession of whistles, buzzes, and croaks. Orcish is not among the four languages I can converse in, but I walked around the pool for about 15 minutes, while the whale companionably kept pace, and kept rearing out of the water at my feet to continue the colloquy. Several weeks later, an ethologist told me that the whale’s behaviour was exactly what Orcas do toward seals on an ice-floe, in order to persuade them to come into the water to be eaten. Pied piper? It would be something to see that happen. What is that seal thinking – the one who chooses to ‘play’ with an orca rather than lie on the ice? I bet there is some connection to the mythology of mermaids singing their siren songs. Perhaps you should consider yourself lucky you were not snatched! Well, at least *somebody* likes anchovies. Very beautiful. As Im sure Grania will confirm, we have fin whales off the coast of Ireland at the moment. I have some pics being prepped. Wow, bringin’ a camera on-board a boat with Bruce Lyon is like flashin’ a knife in front of Crocodile Dundee, huh? Ooh! Canon 100-400mm Mark II spotted! I have that lens now and can verify shes’ a heavy ‘un. Yeah, I’m sure he had to use a high shutter speed in that grey weather and on a choppy surface trying to steady that lens. (Assuming he didn’t use a tripod or monopod that’s not shown.) I have a Nikkor 80-200 (about half the size) and it’s a bugger to get sharp handheld photos when it’s not bright and still. I love the 5-axis IS in my Olympus OM-D E-M10 Mark II. Tripod/monopod would not help much on a boat deck that was moving with the waves. Thanks for this enjoyable post. What fun that must have been! I’ve seen humpback, orca and beluga whales in the wild, but never so many, so close, and with so much activity. Re “a very small dorsal fin (what use is it? )” So they can play a shark in the school play? Very interesting behaviour from the cooperating bird, mammal & fish predator species. HERE is a video of Norwegian orcas ‘carousel feeding’ on herring – the herring are fast & nimble so the orca use tail slaps to stun the ‘herd’ with pressure waves. The orca also flash their white undersides to panic the herring into the ball formation. I wonder – if an orca had turned up in the Attenborough video would it cooperate or snack on sea lion? I can’t stress enough how envious I am of you. That looks like it was a phenomenal whale watching expedition. 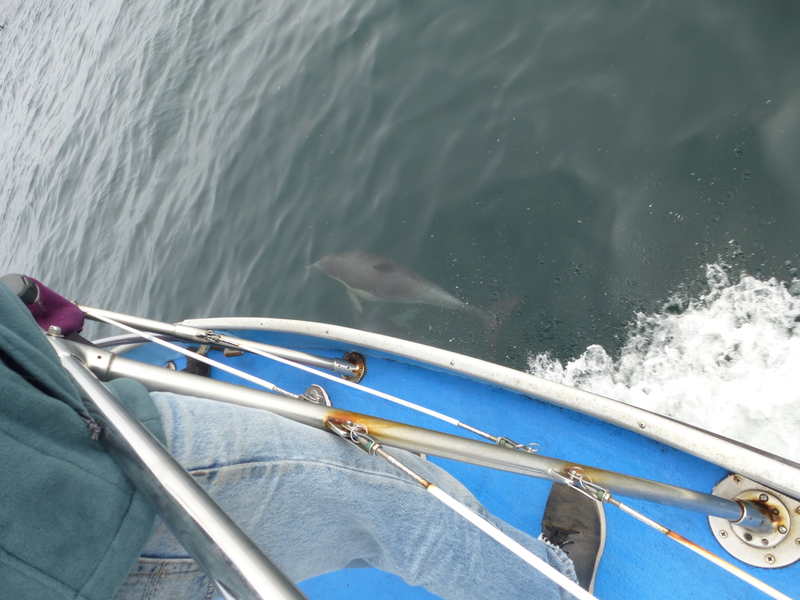 I can nearly guarantee that if I went on such a trip we would have seen nary a sign of whales on that day. You certainly hit an unusually good day out of Moss Landing. The closest I’ve come to comparable feeding activity was in the channel just outside Juneau, Alaska. a l l of it withOUT such gazing – good fortune ! Thank you for sharing the awesome videos! Did you mean to type “THAR she blows”, Jerry? Thanks for a most wonderful post. I’d love to experience that. It’s a trip of a lifetime! (Anchovies are one of my favourite things to eat, she says to Keith at comment #6). What a wonderful trip that was!!! Whale watching in a feeding situation is something I’ve always wanted to do, and these pics made me salivate! I can’t wait to see Bruce’s pics as well. I bet the one with the smallest dorsal fin has the biggest pick-up truck. Beautiful but you know what is really really bad for whales? Whale watching. Google it. I think it depends on how it’s done. In Rosario Straight, they used to drive up to the whales. Now, they (the boats) stop (and there are LOT’S of patrols) and wait for the whales to swim past them. They aren’t allowed to motor closer than about 300m. The whales swim right up to the boats (if you are lucky). Sure, it can be done really badly. Given your claim, you may have wanted to to flesh it out a bit more than “google it”.